The BBC spin machine works on the premise that anything sells classical music except the music itself. 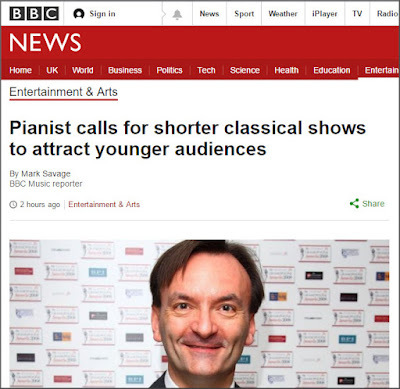 So after some transparently contrived brouhaha about applause between movements at the Proms we have BBC News reporting the pronuncement by Stephen Hough - he plays at the Proms next week - about shorter classical shows. (Did they mean concerts?) 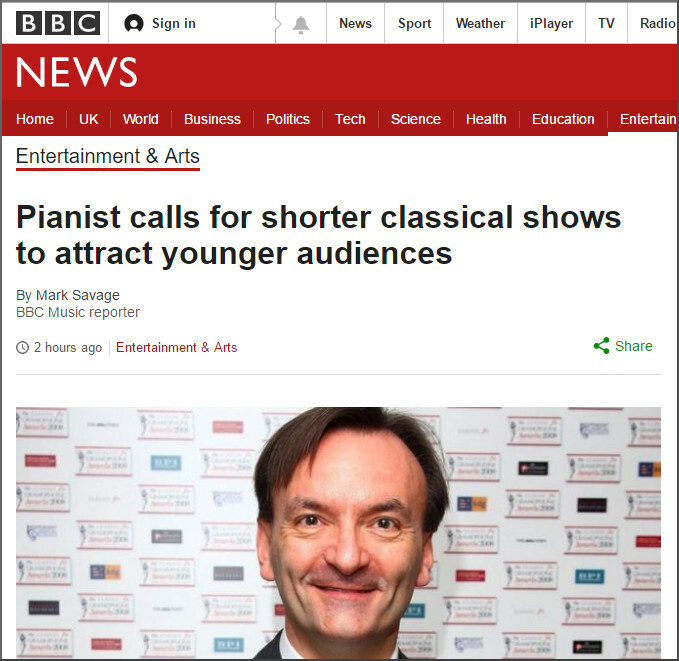 Shorter classical concerts are just another way of talking down to the audience - young and not so young. The first step towards consolidating the overlooked but vital existing classical audience and to attracting a new audience is to stop talking down to both groups. As Virgil Thomson told us: "Never underestimate the public's intelligence, baby, and never overestimate its information". Glad to see this was a short post. My attention span cannot cope with more. On Facebook Daniel James Wolf has commented "Race to the bottom". I dunno. I've been to my share of classical music "shows" where it was obvious that some filler piece or another was plopped into the program just to fill out the time when really we all could have just left after the main course, as it were, and been happy. So while I agree that the framing of his statement (really more the angle that the press report took) is a bit off, I also don't see anything sacred about the 2-2.5 hour running time. Concerts should be as long as they need to be to get their point across and no longer (and no shorter). I agree that we should not be patronizing to the audience, but slavishly following traditional rituals just for the sake of following them is also something we ought to avoid, in my opinion. In the 19th century, concerts were usually a good deal longer, but the programme was more varied, with a mix of different ensembles, vocal and instrumental music, excerpts from popular works and more absorbing new music. So length isn't a problem per se, as many have also pointed out in comparison to contemporary blockbuster movies.